Bing search from Microsoft has become more social through Facebook. You can easily enable social search on Bing by connecting your Facebook profile with Bing Search. Social search will display more customized and relevant search results through your Facebook activity details. You can search for people and old friends on Bing and add them as Facebook friends directly. Bing search results will also display what your friends liked on Facebook, when matching content is being searched on Bing. For example: searching for movie will show if specific Facebook friends liked that movie (and have commected about it). 1. Open Bing Search website and look for Sign in option at the top. Click Sign In and then click ‘Connect to Facebook’ option. 2. You will get Facebook login screen (if not already logged into Facebook account). Enter your Facebook login details and you should see ‘Request for Permission’ screen after successful login. For Bing social feature, it will use your basic Facebook profile information which includes: name, profile picture, gender, networks, user ID, list of friends and any other information shared with everyone. 3. If you are comfortable sharing your Facebook profile information with Bing search for more customized search results based on your Facebook activity, click Allow button. Then you will be redirected to Bing Search and now you should see your active Facebook login in place of Sign in button. You can proceed searching the web on Bing (like you did before). Now search results will be more social after connection with your Facebook profile. 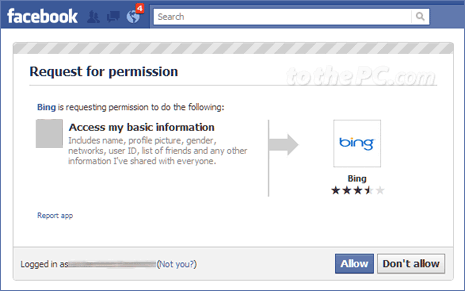 You can also disable Bing access to Facebook information for social search feature for privacy concerns.